Two historic New York City theaters are getting ready to shine brightly under the Times Square spotlight once again. This week, developers behind the Times Square Theater and the Palace Theater, unveiled ambitious renovation and expansion plans for their establishments. First, let’s take a look at the Times Square Theater. The nearly century-old gem has remained vacant for the past 30 years, and it is the last of the 42nd Street corridor theaters to be redeveloped. Now, Stillman Development International, LLC (S.D.I.) is reimagining it as a large retail venue. The firm has brought on Beyer Blinder Belle to restore much of the existing structure and add in a two-story, glass addition. Beyer Blinder Belle is known for its renovation of historic buildings throughout the city including the Grand Central Terminal and City Hall. At the Times Square Theater, the firm plans to raise the facade by about five feet to create taller ceiling heights, according to the Wall Street Journal, which first reported on the new development plans. Other restoration efforts will focus on the interior neoclassical motifs, the proscenium arch, and the grand dome. New additions include a glass box overhang on the second floor that will let visitors look out on to 42nd Street, and two large terraces on the third and fourth floors of the building. Stillman told the Journal that it was targeting brands like Apple, Amazon, and Coca-Cola. Stillman is leasing the property for up to 73 years from the non-profit The new 42nd Street, which was established in 1990 to revive the then blighted Times Square area, particularly the 42nd Street corridor. A rendering of the Palace Theater redevelopment. A few blocks away, The Palace Theater is also set to undergo a major revamp. The City Council signed off on that massive redevelopment earlier this year. The theater itself will be raised about 30 feet, which will create more space for its operations, and also open space for retail on the ground level. The existing DoubleTree hotel above the theater will start getting demolished later this year, and in its place will rise a soaring new tower with retail, dining, and a hotel. Fast Company first reported on the reveal of the redevelopment plans. 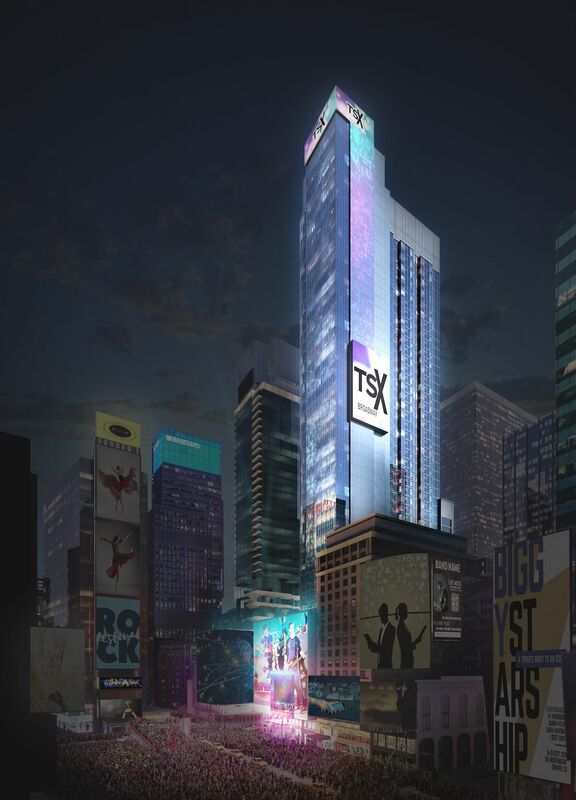 This new 46-story complex will be known as TSX Broadway, and it is being jointly developed by L&L Holding Company, Maefield Development and Fortress Investment Group. The Nederlander Organization will continue to operate the theater separate from the rest of the project. The $2.5 billion development will have 75,000 square feet of retail across 10 floors, above the theater. The two floors above that will 30,000 square feet of food and beverage venues, including a 10,000-square-foot outdoor terrace, which will reportedly be the largest such terrace in the Times Square area. The floors above that will have a 669-room hotel. A full rendering of the hotel. 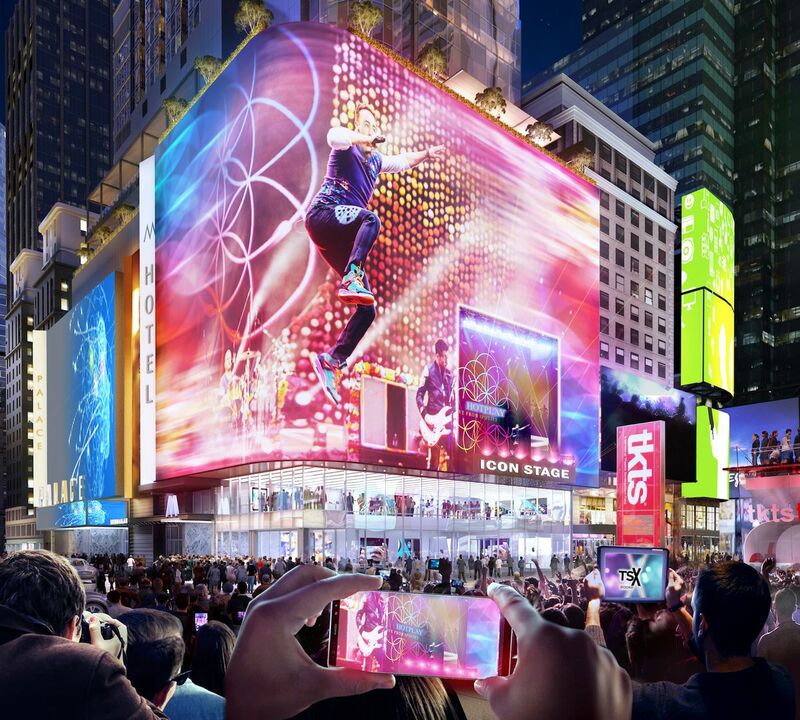 Other notable features of the development include a 4,000-square-foot performance venue that will be suspended 30 feet above Times Square; this will be the only permanent outdoor stage in Times Square. The wraparound signage on the building—which was mentioned in previous updates on the project—will measure a staggering 18,000 square feet, and its presence is evident from the renderings of the development. The redevelopment of the Times Square Theater will take about two years to finish, and the Palace Theater revamp will take about three years. A detailed look at the retail portion of the building.